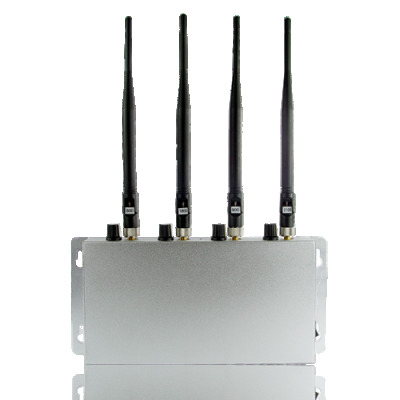 Successfully Added Adjustable Strength Cell Phone Jammer - 4 Band Jammer to your Shopping Cart. Powerful mobile phone jammer for completely stopping all mobile phones operating on the CDMA, GSM, DCS, 3G bandwidth, and featuring jamming strength adjusting for each of the four bandwidths. For all those areas that require quite, for example classrooms or theaters, this is a God sent telecommunication device. Whether it is placed on a desktop, or inconspicuously mounted on a ceiling, it will jam cell phones within a 50 Meter distance without disrupting any other electronic device in the vicinity. If you can't get people to stop using their mobile phones where they are not supposed to, force them to with this wholesale price made in China mobile phone jammer. Note: Mobile phone signal jammers may not be permissible to import into certain countries due to licensing of broadcasts or other restrictions. Please check your country's customs / telecommunications regulations before placing your order.